Editor/Author Fisher Gary L. and Roget, Nancy A. 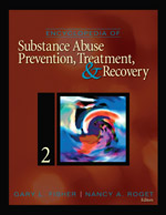 The Encyclopedia of Substance Abuse Prevention, Treatment, and Recovery presents state-of-the-art research and evidence-based applications. The Encyclopedia focuses on the information that addiction treatment and prevention professionals and allied health professionals need to effectively work with clients.